Hostal La Plata-Good Rooms, Madryt, Hiszpania : Rezerwuj teraz! A nice little hostel where you will enjoy the great location and the great attention of the staff. A hidden treasure in the heart of Madrid! La Plata is basic and comfortable, with star rating 2. A handful of rooms to choose from here creates an authentic and intimate atmosphere. 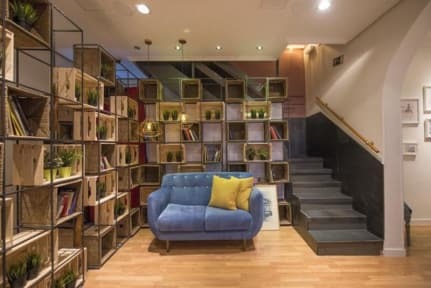 You leave the hostal and you´re in the center of Madrid, a Madrid intense! Every hour is different: during the day you can breathe vitality, art and culture. At night go out to have a good dinner, drink something on a terrace, before or after having enjoyed a musical , theater, etc. We are in one of the most important avenues of Madrid, Gran Via. This means that at a walking distance the guests can arrive to the most important points of Madrid such Sol, Plaza Mayor, Teatro Real, amongst other important landmarks of the city. 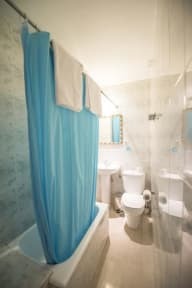 Each room comes with an en suite bathroom with a hairdryer, air conditioning, free Wi-Fi, an LCD TV, and a safe, and ironing facilities are provided at the 24-hour reception. The reception is open for 24 hours per day.